Russian security officers have arrested several scientists working at a top-secret Russian nuclear warhead facility for allegedly mining crypto-currencies. The suspects had tried to use one of Russia's most powerful supercomputers to mine Bitcoins, media reports say. The Federal Nuclear Centre in Sarov, western Russia, is a restricted area. The centre's press service said: "There has been an unsanctioned attempt to use computer facilities for private purposes including so-called mining." The supercomputer was not supposed to be connected to the internet - to prevent intrusion - and once the scientists attempted to do so, the nuclear centre's security department was alerted. They were handed over to the Federal Security Service (FSB), the Russian news service Mash says. "As far as we are aware, a criminal case has been launched against them," the press service told Interfax news agency. Crypto-currencies like Bitcoin do not rely on centralised computer servers. People who provide computer processing power to the crypto-currency system, to enable transactions to take place, can get rewards in Bitcoins. 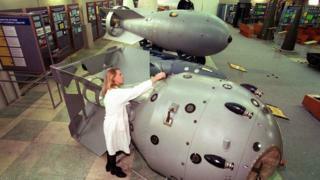 In the Cold War the USSR's first nuclear bomb was produced at Sarov, during Joseph Stalin's rule. The top-secret town was not even marked on Soviet maps and special permits are still required for Russians to visit it. Sarov is surrounded by a tightly guarded no-man's-land, with barbed wire fences to keep the curious away. There are suspicions that the radioactive polonium-210 used to kill ex-FSB agent Alexander Litvinenko in London in 2006 came from Sarov. The Federal Nuclear Centre reportedly employs up to 20,000 people and its supercomputer boasts a capacity of 1 petaflop, the equivalent of 1,000 trillion calculations per second. Mining crypto-currencies requires great computational power and huge amounts of energy. There have been reports of some other industrial facilities in Russia being used for crypto-mining, and one businessman reportedly bought two power stations for the activity. (link in Russian).